VOTE: Who was Week 1’s southwest Missouri high school football player of the week? Wyatt D. Wheeler Springfield News-Leader Published 4:55 p.m. UTC Aug 27, 2018 The first week of the high school football season is over and a number of athletes across the area impressed. 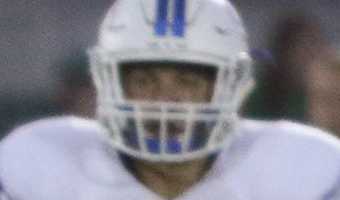 Each week, the News-Leader will select the student-athletes with the best stats and let readers vote on who they think is deserving of a player of the week honor. More: For Lamar, having the nation's longest winning streak might not be as fun as you'd think More: Tyson Riley's heroics give Springfield Catholic a thrilling win over Seneca More: Four hot takes from Week 1 of southwest Missouri's high school season At the end of Week 1, six athletes were selected as finalists for the best player of the opening week. Voting is open until 3 a.m. on Wednesday. There is no limit to how many times you can vote. In the future, the public and high school coaches are invited to nominate athletes for who they think are deserving. Email News-Leader sports reporter Wyatt Wheeler at … [Read more...] about VOTE: Who was Week 1’s southwest Missouri high school football player of the week?